Gluten-free baking usually falls into one of two categories. Either it’s nearly as good as the real thing, but requires dozens of ingredients and gums. 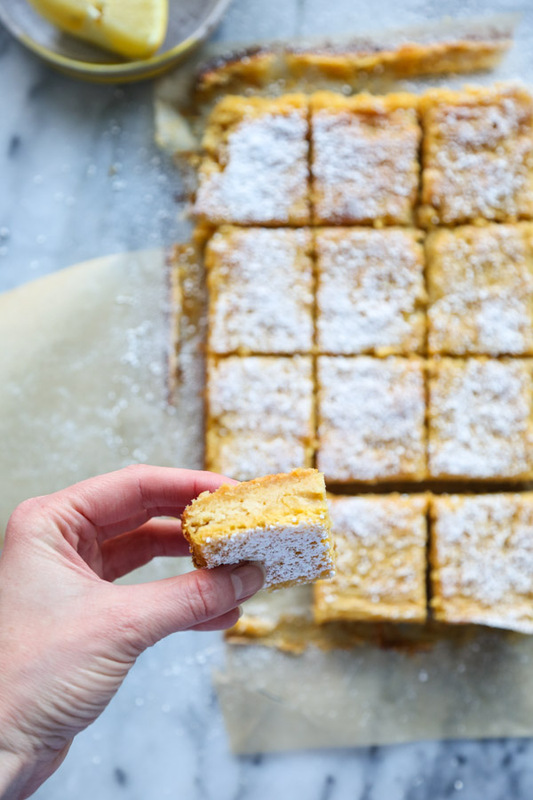 Or it only uses “healthy” ingredients and, though looks like it could kind of be the real thing, it tastes like it was in fact made with chickpeas not flour. 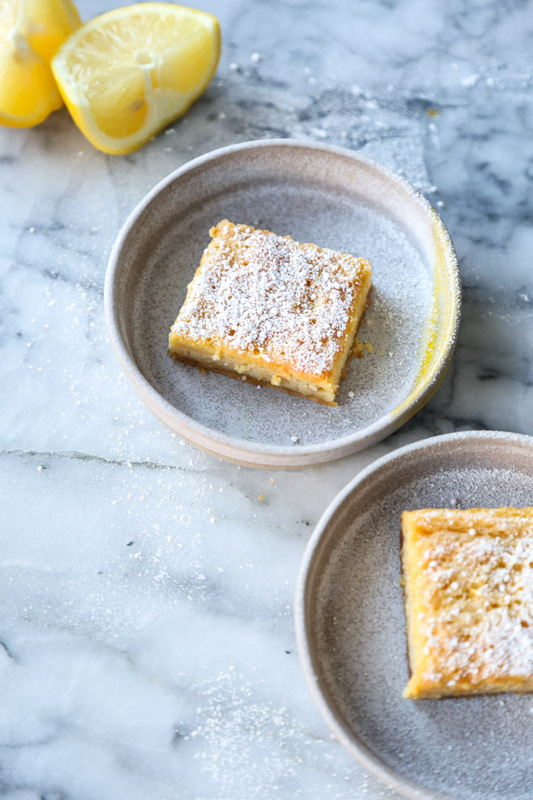 The closest I’ve come to the best of both worlds are these paleo lemon bars. 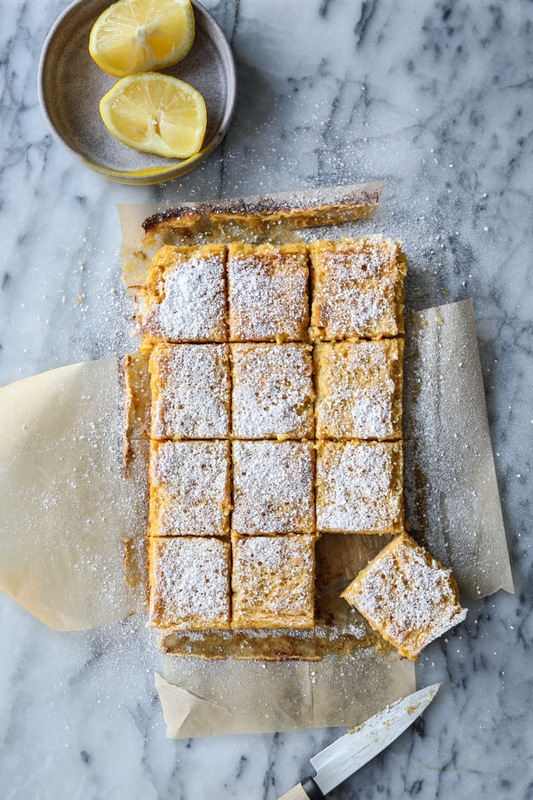 And it’s all thanks to the simple, streamlined recipes in the Sweet Laurel cookbook. Very rarely do I want to cook my way through a book the way I did when I first received Lauren Gallucci and Claire Thomas’ paleo baking bible. The recipes transform the same 10 or so natural ingredients into dozens of drool worthy treats from my childhood. (Despite my mom’s crunchy granola status, she never quite figured out how to bake without white flour either). Usually when I flip through a gluten-free baking book, I know that you guys are going to be too intimidated to try half the recipes because of all the random flours they require. I have most of them in my pantry, and still don’t’ want to break out that many jars for one loaf of banana bread. Everything in Sweet Laurel is very much aimed at the home cook who is just looking for minimally processed, naturally sweetened baked goods without having to spend all day making them. That Laurel is a member of the #HashiPosse is no surprise, and she is officially my new healthy hedonist girl crush! 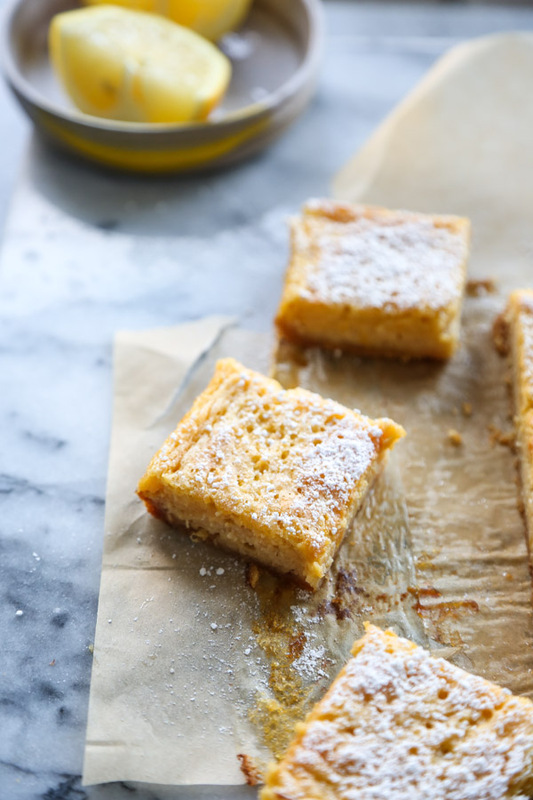 Read on for how to make these simple paleo lemon bars with almond flour crust. I subbed ghee for coconut oil in the crust because my jar was running low and it was equally fabulous. I left out the instructions to the powdered coconut imitation of store bought powdered sugar because it’s brilliant, and I really hope you pick up a copy of the book. 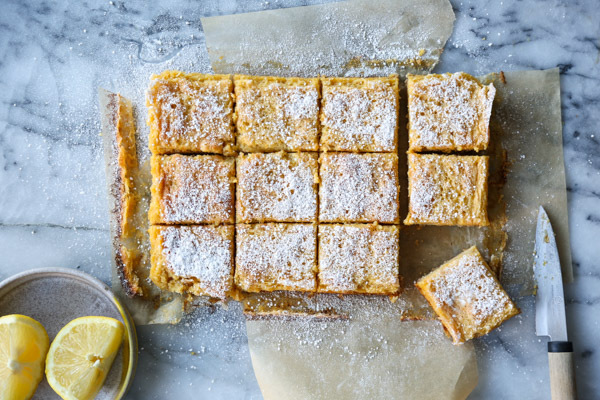 These easy lemon bars are adapted from the Sweet Laurel Cookbook by Laurel Gallucci and Claire Thomas. They use “shredded coconut powdered sugar” on top instead of powdered sugar. You’ll have to pick up the book for that little trick! 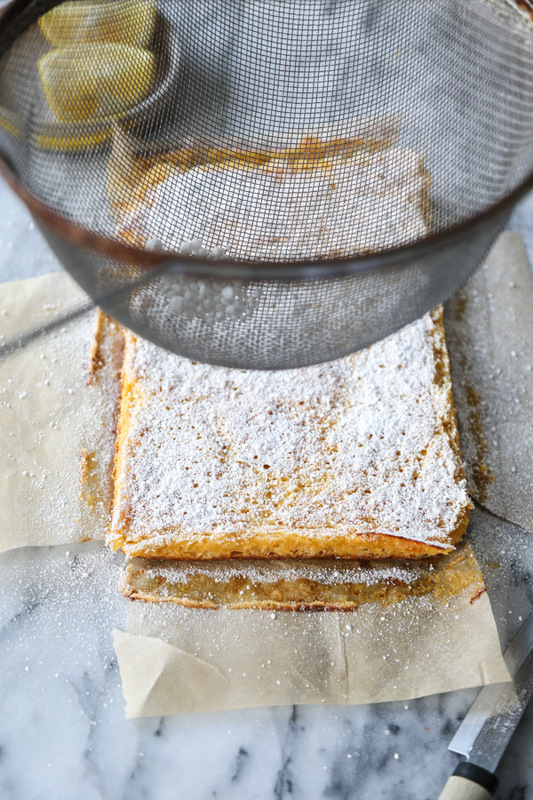 Shredding coconut powdered sugar for serving or powdered sugar! 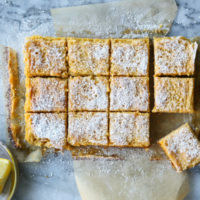 Preheat the oven to 350 degrees F. Line a 8 x 8 inch pan with parchment paper, letting the paper hand over the sides in a cross for easy removal. 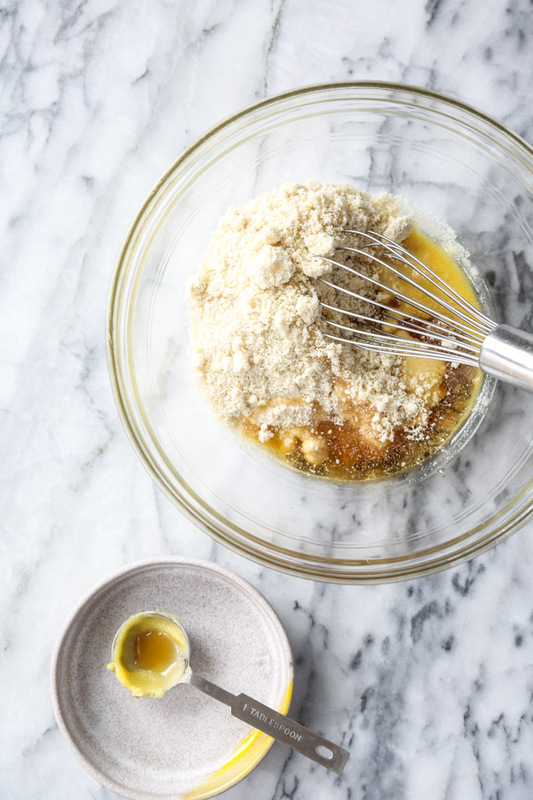 Make the crust: whisk together the flour, coconut oil, maple syrup, and salt in a medium bowl until a soft dough forms. 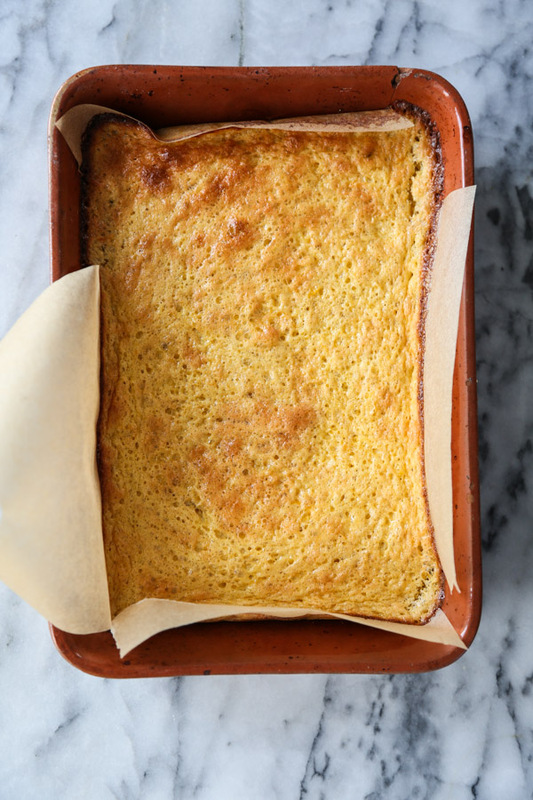 Press the dough into the bottom of the prepared pan, about 1/4 inch thick, and bake for 15 minutes, or until just golden brown around the edges. Remove from the oven and allow the crust to cool while you make the filling. Make the filling: In the bowl of a stand mixer fitted with a whisk attachment (I used a hand egg beater), whip the eggs for about 4 minutes, until frothy. Slowly add the coconut oil and honey, and mix until combined. Fold in the lemon juice and zest by hand. Before adding the filling to the cooled crust, let the filling settle so there are no bubbles on top. You can tap the bowl on your counter a few times to help pop any bubbles. Pour the filling into the cooled crust and bake for another 15 to 25 minutes, or until set at the edges and just barely jiggly in the center. 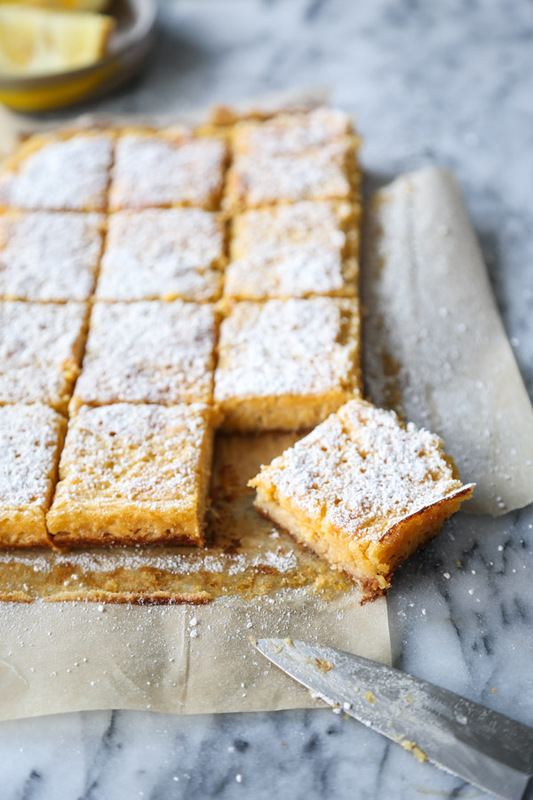 Let the bars cool and set completely in the pan, then dust with the powdered coconut sugar and cut into squares. Store in a sealed container at room temperature for up to 3 days. Can I replace the almond flour with oat? I can’t vouch for that substitution, but report back! The photography in this post was such a joy to our eyes… Kudos sweetie! it would be great with any crust! This was an excellent reading. Knowing what flour is best to consume to maintain a good health condition requires a strong understanding about the effect that nutrients have in our bloodstream. This Pinterest site https://goo.gl/XCQSnw?ericberg also provides valuable information about this and other related topics. I must have messed up big time on the filling. Not creamy looking like yours. Eggs seemed frothy but after adding honey, oil and lemon it all thinned out and looked watery. Its baking but doubt it will turn out. Is there a secret to how the eggs should look before adding those ingredients? When beating with hand mixer what speed do you recommend? And should the honey, oil and juice all be mixed by hand? Thanks! i used a hand mixer and was fine! sped up to high towards the end. you want it very frothy and then hand mix in the rest. I have made this recipe twice now and each time the filling goes underneath the crust. Any idea why this is happening? Please let me know if you have any suggestions. I tried baking the crust a little longer the second time, but it felt overbrowned. So sorry that I can’t be of more help trouble shooting this. 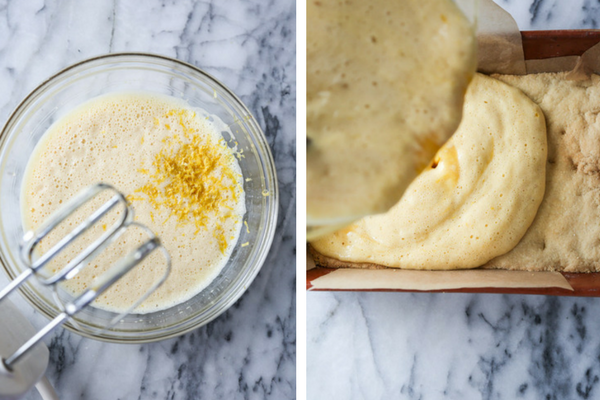 Try DM-ing Laurel on instagram or facebook since it’s her recipe. I wouldn’t have printed if I hadn’t tested successfully, but mine turned out great. Sorry to hear that Adriane. I didn’t have that problem. Perhaps try with a smaller pan if you feel there isn’t enough crust and make sure it’s really pressed up to the sides like a tart. I read elsewhere that, if you pour the mixture into the crust while it’s still hot, instead of waiting for it to cool, the eggs in the mix start to cook and effectively “seal” the crust. Very good to know – thanks for sharing! These worked out very well. Still cooling so no sugar on top, but we like less sweet so may omit that. But the taste great, and no filling went under the crust. 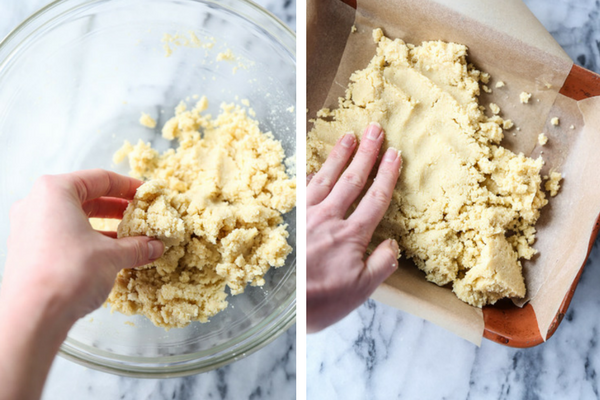 Almond flour makes great cakes and cookies too! Yes, the mixture thinned out after adding honey, oil and lemon, but the eggs firmed it all up in 20 minutes. I will make these again! Thank you.